Nyrstar is an integrated mining and metals business with an underground, poly-metallic mine located in El Toqui, Chile. Operating since 1983, the mine produces 84% of Chile’s Zinc and employs 417 employees onsite. Like many mining locations, the El Toqui power system is isolated from the regional grid system and previously relied on five diesel gensets and two hydraulic turbines for power generation. Due to the high costs associated with operating the diesel gensets, in 2010 Nyrstar invested in a small wind farm as an additional power source. The wind farm comprises six Vergnet GEV MP wind turbines, each generating 0.23 MW. With a rapid project delivery time of only eight months from initiation to commissioning and closure, and official registration and authorisation granted within two months, El Toqui was quickly benefitted from the additional resource of a wind farm to diversify power supply and contribute clean, renewable energy to the site. With over 25 years’ experience in delivering projects within isolated environments with extreme climatic conditions and limited electricity infrastructure, Vergnet was able to adapt project specifications to meet the requirements of the site. This included resizing and reinforcing the turbine blades and lowering the range of operation to ensure optimal performance in a site exposed to high wind speeds. 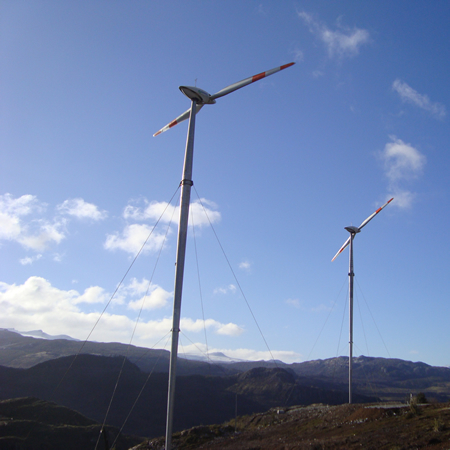 El Toqui personnel has been trained by the Vergnet team to maintain and repair the turbines. In 2014, total power generation from diesel, hydraulic and wind farm sources reached 42.24 GWh at a total cost of $6.3M. In this year, the average cost per MWh of all combined power sources was $148.1/MWh. Heavily reliant on diesel as the primary power source (contributing to 54.3% of total generated power), the average cost per MWh was significantly above average, at $254.5/MWh and a total cost of £5.8M. The wind farm generated 3.4 GWh of power at a cost of $74K and an average cost of $21.6/MWh, contributing to 8.1% of total onsite power generation and representing a significant cost saving with clean, renewable energy solutions. Having a reliable, secure system in place to ensure guaranteed power supply for our large scale mining operation is critical, particularly in such a remote location without grid connection. Since investing in a wind farm with Vergnet, we are able to maximise generating capacity and benefit from significant cost savings with renewable energy. We estimate that over 7.7M litres of diesel will be saved each year from renewables integration, with the wind farm contributing to a saving of over 1.2M litres of diesel per year. Additional savings are also made through reduced maintenance costs and extended time between overhauls, offering even greater value for money.